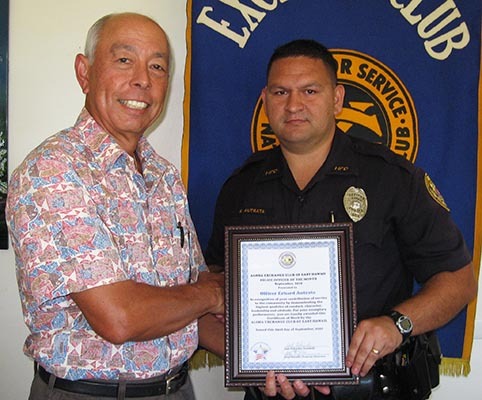 Aloha Exchange Club Representative Joey Estrella presents an ‘Officer of the Month’ award to Officer Erhard Autrata. 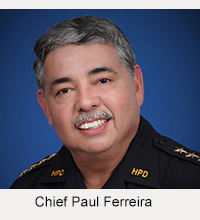 The Aloha Exchange Club of East Hawai’i recognized Officer Erhard Autrata on Thursday (September 23) as “Officer of the Month” for September. Autrata made 19 DUI arrests and issued 39 citations in the month of July and has had perfect attendance for the past three years. 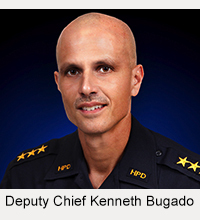 “Despite the stress, heavy case load, late hours and court on days off, he still takes pride in coming to work and serving the community,” Makua said.